Since the start of the season Jonboy and I have been talking about live baiting for the bigeye tuna. Seeing that there have been a few around, we decided to give it a try. As we made our first pass off Cabo Girou, we started marking some nice bait schools. After around 6 drops with the sabiki’s we had 20 nice size mackeral’s in the live well. We put a couple out and slow trolled them around the bait schools. After about 30 mins the long bait got bit. Kevin,the crewman of “Omega” jumped in the chair. As we thought we had a bigeye tuna on we were pleasantly surprised when a blue marlin came up at the back of the boat. I had a good pull on the leader then the hook came out and the fish swam away nice and healthy. We estimated him to be around 350#. It was Kevin’s first blue marlin as an angler and we were very happy that our plan came together. Also today “Tightline” caught their first fish for the season, a decent one around 500#. 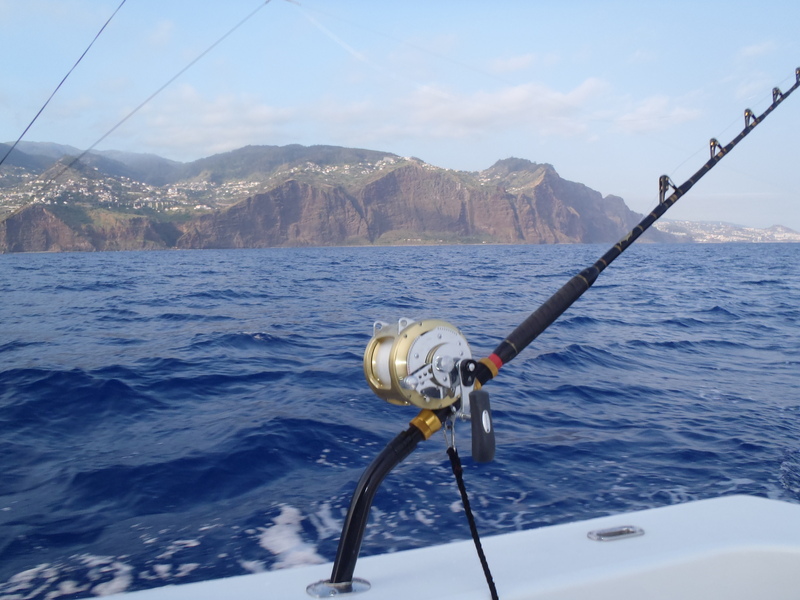 “Pesca Grossa” found a nice fish they called around 600# out to the west of Calheta. A great day fishing for all the boys. “Jenita” haven’t fished many days this season but when they do they seem to get lucky. Yesterday they went out for an afternoon fish and got climbed on off Cabo Girao. They fought the big blue for just over 2 hours and when they were finally able to get the fish to the boat they tried to revive her but were unsuccesful. Back at the dock she pulled the scale down to 775#. A nice fish and a great effort by all on board. The “Omega” was fishing in the same area and they had a 200# bigeye eat their short corner lure, guess it wasn’t leader shy. “Razzin Hell” raised 2 fish that wouldn’t eat. Today “Xareu” hooked a nice fish but lost it after a short fight. That was the only fish seen today by the fleet. The condition’s still looks good. 200# Big Eye Tuna - "Pesca Grossa"
250# Big Eye Tuna - "Grander"
The bite has remained steady for the fleet with most boat’s seeing good number’s of bigeye tuna and a few blue marlin. 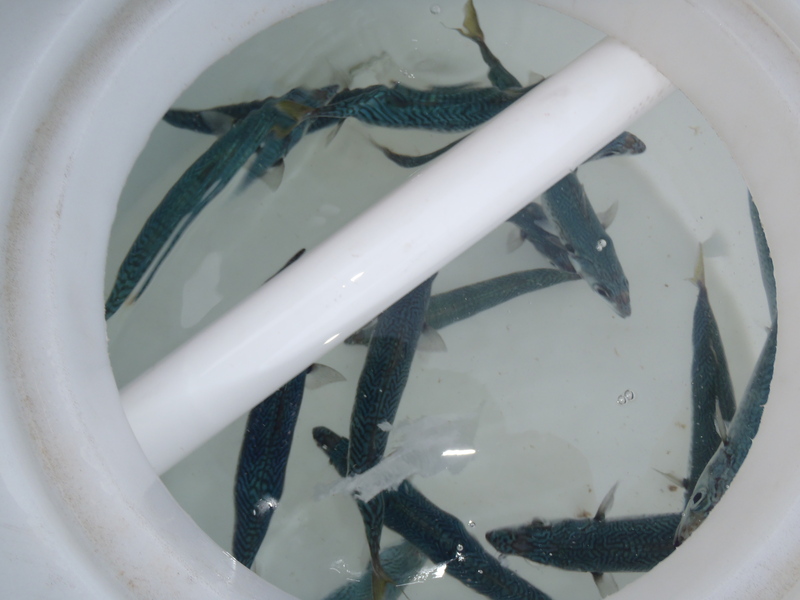 Yesterday “Sorted” released a nice fish around 700# on their first day out for the season. Shortly after the “Margarita” caught one around the same size. 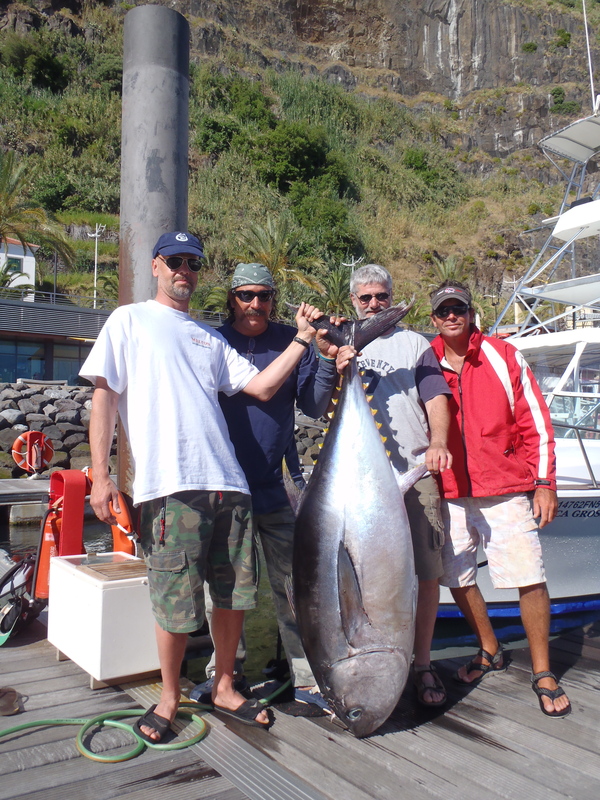 “Magic” was on fire again with the tuna’s, they caught two bigeye tuna’s. One was just under 200# and the other around 150#. Captain Frothy on the “Pesca Grossa” caught a nice bigeye around 200#. Today we watched “Margarita” release another nice blue marlin and a few boat’s found some more bigeye’s. Most of the fish are being caught of Cabo Girou. “Pesca Grossa” released their first marlin, a decent fish around 500#. 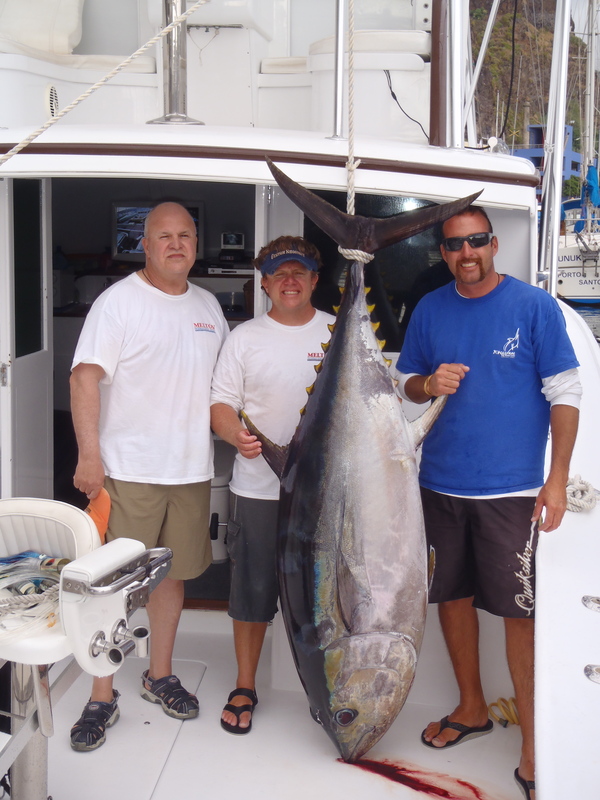 On the “Grander” we got a double-header of bigeye’s, pulled the hook on one and put the other one in the boat. It was a nice tuna and came out to around 250# on the formula.”Magic” caught another bigeye around 180#. The conditions were perfect for tuna today with steady water temps and plenty of cloud cover. The bait is stacking up more and more everyday and the currents bringing the good water all the way into the edge. The water temp is finally getting back to normal in Madeira and it made the fish bite a little better. The boys on “Omega” found a decent fish around 450# first up this morning. While they were fighting their fish “Magic” raised a nice one in the same area. Just after “Omega” released their fish the “Balancal” caught and released a nice 650# fish. All of the bites happened before midday. We missed a small white marlin on the “Grander”. 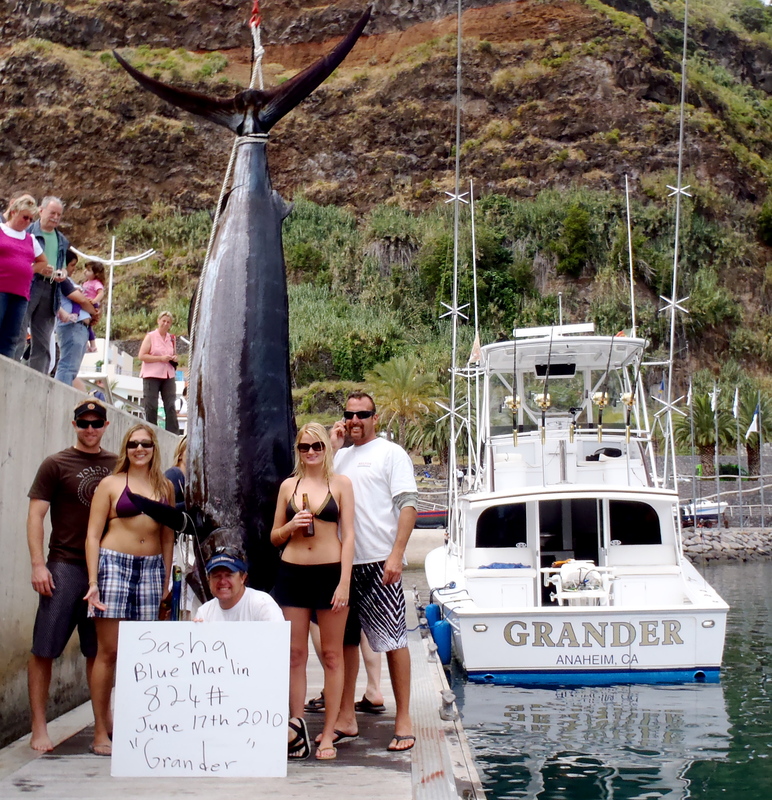 Hopefully this is a sign of thing’s to come.Yesterday “Magic” weighed a 297# Bigeye tuna. 824# Blue Marlin - "Grander"
Took my wife Lisa and our good friends Sasha and CJ fishing today and it didn’t take long for us to get bit. We had only been fishing for ten minutes when we started marking some of the biggest bait schools we had found this season. A nice fish around 700# piled on the teaser before dropping back and engulfing the long corner, a Randy Llanes tube. The big girl only jumped a few times up in front of the bow then she went down. Sasha was up in the chair and she did a great job for her first time ever marlin fishing.It was a tough fight that lasted around an hour and we pulled the hook close to the boat. Everyone on board was a little disappointed but the marlin gods were looking after us. We put the lures back out,trolled over the same bait school and raised another big one. She ate both teasers then crashed the Polu Kai instigator on the long corner. She made a big first run and headed straight into the shoreline. At one stage we were fighting her in 50ft of water almost on the rocks! We were able to turn her and she started heading offshore. Sasha was in the chair again and now with a bit of practice from the previous fish she was able to bring the big fish to the boat in just under an hour. Andy from the “Pesca Grossa” jumped over the help us and we put the gaffs in and slid her in the boat. Back on shore she weighed 824# and Sasha was very happy with her awesome catch. Hopefully the bite’s about to turn on for everyone. On the last day of the Madeira Blue Marlin Tournament there were no fish caught for the tournament fleet. 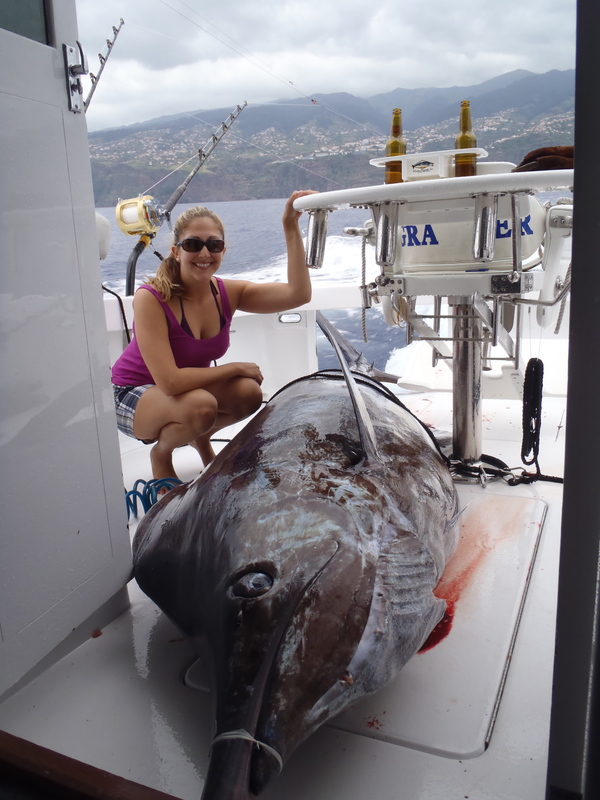 There are still a few fish around as we were able to raise a 400 pound blue that wouldn’t eat and a non-tournament boat, fishing out of Funchal, released a 700 pound blue. Today was the 1st time in a week that the conditions are starting to come good. The long-range forecast shows that the trade winds are meant to blow steady for the next week. Hopefully this will bring the fish back on the bite. This morning the fleet gathered outside Marina de Calheta for the start of the 2nd annual Madeira Blue Marlin Tournamant. Everyone had high expectations but unfortunately the fish didn’t want to play the game. There was only one fish raised between the 18 boats. Hopefully the fishing will improve tomorrow and every boat will get some action. It’s been 4 days now since we have seen a fish on the “Grander” and the conditions don’t seem to be helping either. The water temp is a few degrees cooler than we like and the water could clean up a little more. We just need a few days of steady weather. There is still alot of bait on the edge and the currents pushing in the right direction so I think it’s only a matter of time before it fire’s up again, finger’s crossed for tomorrow.